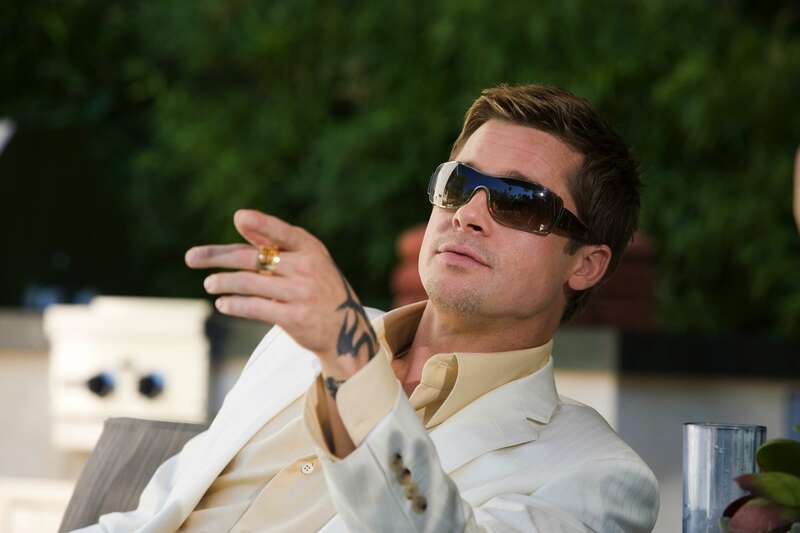 Brad Pitt as “Rusty” Ryan in Ocean’s Thirteen (2007). Happy Memorial Day! I hope all you gents out in BAMF Land will be celebrating the holiday with an outdoor cookout… or possibly planning a multi-million dollar casino heist with your buddies. In either case, it’s safe to wear white again. Rusty meets with his con artist cohorts Danny Ocean and Roman Nagel while wearing the loudest outfit of the trio. While Danny and Roman prefer all black, perhaps in accordance with the shady nature of their planning session, Rusty aims more for climate and style than criminal purpose. Rusty’s suit is white-on-white tonal pinstripe in lightweight silk. As usual, Rusty wears his suit without a tie. The criminality of Rusty and Danny’s venture is evident by the noiresque shadows over them. The perfect fit of the suit confirms my belief that the mid-2000s was a sartorial high point in recent years, bridging the extra-baggy ’90s and overly slim suits seen today. Then again, it would be a challenge for any costumer to make Brad Pitt look bad. A brighter-lit shot from the same angle shows more aspects of Rusty’s suit jacket. The suit jacket is single-breasted with notch lapels (and a buttonhole through the left lapel). The shoulders are padded with roped sleeveheads. Rusty’s suit coat closes in the front with a single brown horn button, although he leaves it open for the whole of the sequence. The sleeves have fully-functional 4-button “surgeon’s cuffs”, although he only leaves three fastened, following the rakish pattern set by Daniel Craig’s James Bond to mark a bespoke suit. It’s a flashy gesture that fits a flashy dresser like Rusty. In addition to the welted breast pocket, Rusty’s suit coat has flapped hip pockets that slant rearward like a hacking jacket. Unlike a hacking jacket, it has double vents. The product placement train keeps rolling as the Stella Artois-drinking Rusty provides a Dell laptop for Roman. The flat front suit trousers rise low on his waist. They have two frogmouth front pockets and jetted rear pockets. The waistband closes with an extended squared hook closure tab in the front, although the trousers are meant to be worn with a belt. 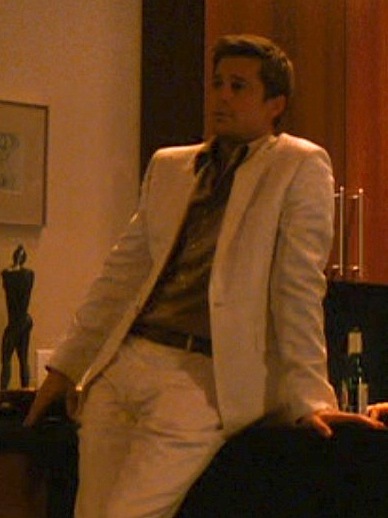 Although Rusty wears white chino trousers with a few other outfits in Ocean’s Thirteen (including with his mustard sportcoat at the airport), these are clearly a different pair that matches the suit as evident by the tonal pinstripe and the frogmouth front pockets that differ from the on-seam side pockets on the other chinos. A stylish guy like Rusty isn’t going to ignore the matching belt and shoes rule, although we don’t get much of a look at the latter. His faux-distressed leather belt from Prada is caramel brown with dark brown gradient edges and a thin squared gold buckle. The brief glimpse we get of his shoes offers what may be light brown leather with cream dress socks. And there you have it. The only look we get at Rusty’s feet in this outfit. Some men might opt for a more subtle shirt to offset such a loud suit… not Rusty, though. Rusty wears a gold textured shirt with a distinctive metallic sheen. It has a large collar that he wears open with the top two buttons undone, buttoning the rest down the plain front. He also wears the rounded cuffs unbuttoned, typically rolling up his sleeves when the jacket is off. Rusty is no slave to sartorial conventions by any means, but when he sports a white suit, brown supplements, and a gold shirt, it makes sense that he’d keep his jewelry all gold for a consistent palette. He wears his usual thin gold necklace with a gold pendant, mostly concealed by his shirt here. His watch is a yellow gold Rolex GMT Master II with a black bezel and black dial, secured to his right wrist on a gold Oyster-style link bracelet. Rusty proudly shows off his GMT Master. I’m not sure what the context of this photo is, but it’s almost definitely from the filming of this scene. The production photo also excludes the gold pinky ring that Rusty wears on his left hand. The scene could also double as a beer ad as two of the coolest men in Hollywood wear sharp suits and plan a slick casino heist all while enjoying bottles of Stella Artois. 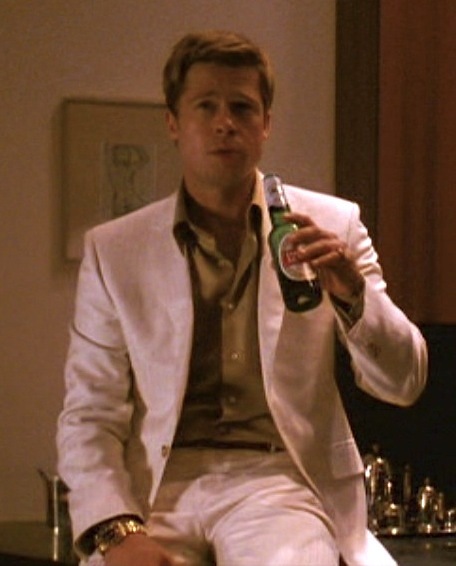 Once again, Brad Pitt’s Rusty Ryan offers a flashy, distinctive outfit that many can attempt, but few will actually pull off. Buy the movie, or even the whole series . Apropos for Memorial Day! Well played, Sir! Have you considered comparing/ contrasting this suit with Sean Connery’s in ” Diamonds Are Forever”, and Daniel Craig’s in “Layer Cake”? I don’t know if you have ever featured 3 different looks in one post, but I would be interested to read your take on all three. Good thinking! I tend to have a special place in my heart for cream/tan summer suits, and I like the three you’re lining up for comparison. I’ll keep this in mind for a future post.